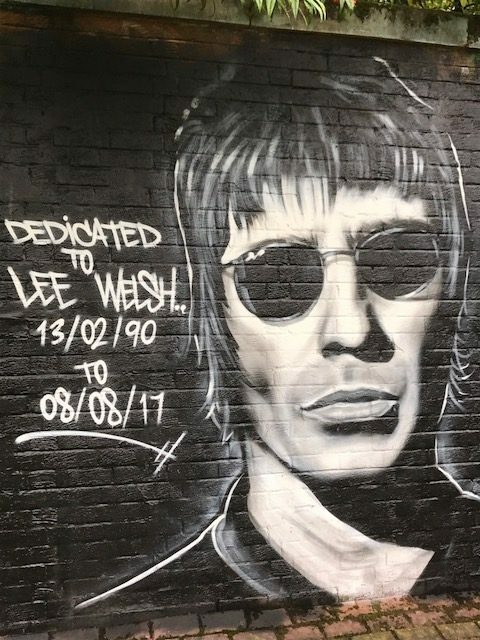 From the Courier – Original Article This is about the fantastic graffiti tribute to Lee. Phil and Lesley with the work dedicated to their son. A Dundee family devastated by the loss of their son say an art wall dedicated to his memory has left them “lost for words”. Lee Welsh died in August. The 27-year-old had suffered from mental health issues and his family have since campaigned for enhanced mental health care. 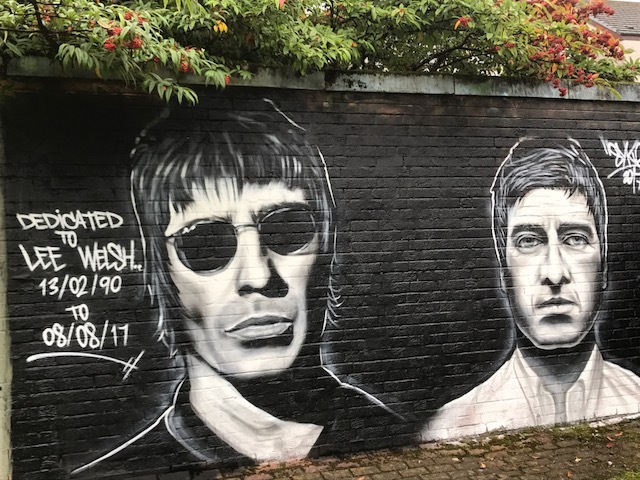 The Courier told last week how a local artist had dedicated an Oasis-themed mural to music fan and talented musician Lee. 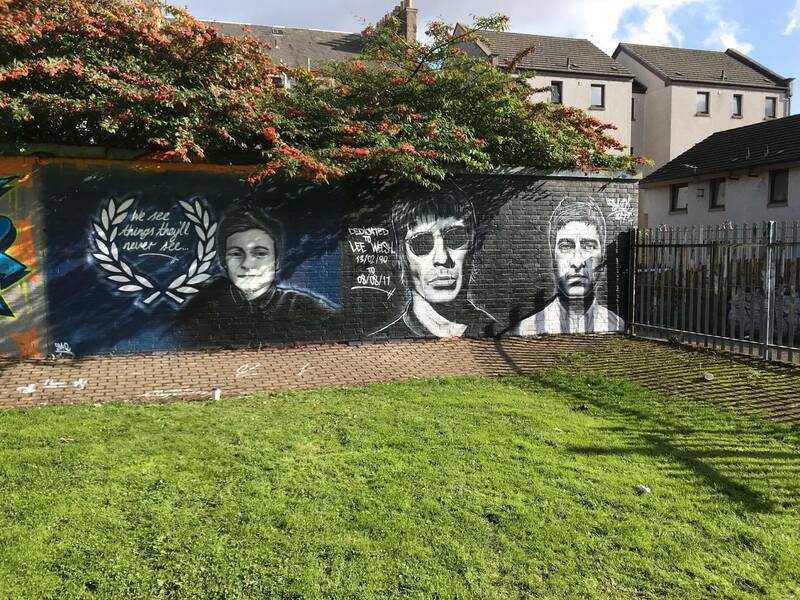 Symon Mathieson, from SYKE Graffiti Art, has now designed a mural of Lee himself, next to the previously designed Oasis artwork at Dundee’s DPM graffiti park. 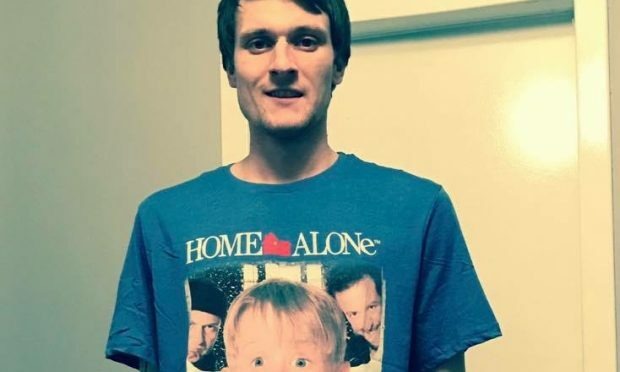 Lee’s family say the care and attention to the design shows how well loved their son was. 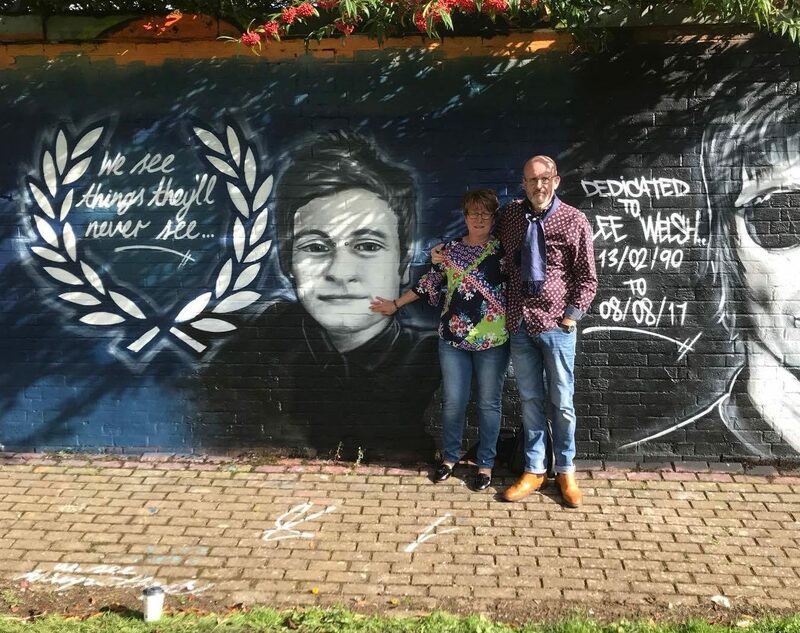 Lee’s parents, Phil and Lesley, were invited to the unveiling of Lee’s mural on Saturday and said they are “lost for words” by the love shown for their son. Phil said: “We received a phone call from one of Lee’s friends requesting that Lee’s mum and I come along to the DPM on Saturday at 2pm, which we did. “His mother and I adore it and Lee would have loved it. “Seeing something like the mural on the wall emphasises to his mother and I how loved Lee was and that offers us comfort. The Welsh family have already said they believe more has to be done to help those living with mental illness. Phil, Lee’s mum, Lesley, and sister, Kirsty, believe Dundee should have its own crisis centre, similar to an initiative in Edinburgh, where those experiencing severe mental health issues can go for care. A race night and disco in memory of Lee will be held at the function suite of Dundee’s Skyaxe Combat and Fitness Centre on November 18. A website has been created by the family to share stories of mental health which can be shared with politicians and charities. SYKE Graffiti has created a tribute to Lee in Dundee. 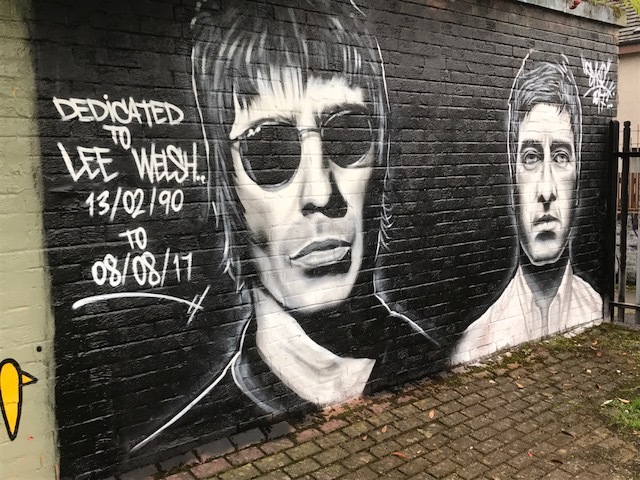 Lee was a huge Oasis fan and the family are over the moon that this has been done for Lee. You can see images of the murals below, however. we’ve also added a Tribute page to the site where these are featured and we’ll also be putting images of other tributes & fund raising events. A story from the Courier about plans to create a permanent memorial to Lee. Friends of a Dundee man who took his own life plan to create a permanent memorial to their friend. Lee Welsh passed away last month and the 27-year-old’s family have since campaigned to promote the need for better mental health care provision. Lee’s close friend Gary Shields intends to purchase a bench in memory of the talented musician. “If it’s a nice day Phil and Lesley (Lee’s parents) could go up with Poppy, Lee’s daughter, and have a picnic. They could go there and be with Lee. “It’s a nice way to remember him. It’s something to keep us going. I wasn’t sure what I was going to do. I was maybe going to organise a football match. A fundraising page was set up in the wake of Lee’s death, with donations pouring in from members of the public and it has already smashed its fundraising target. More than £4000 has now been raised after a £3000 target was initially set, but such was the generosity, Lesley had to extend the timescale of the page. Phil has thanked members of the public for helping raise the “brilliant” amount. A race night and disco will be held in the function suite of Dundee’s Skyaxe Combat and Fitness Centre on November 18. Tickets for the event go on sale next week and can be purchased by either contacting Gary or friend Ryan Taylor. A website has been created to share stories of mental health which can be shared with politicians and charities.